Trademark 'em – Does the service mark Brewskee-Ball infringe the trademark Skee-Ball? Defendant Full Circle is a customer of Skee-Ball, Inc., using standard Skee-Ball machines manufactured by Skee-Ball, Inc. for its Brewskee-Ball tournaments. Despite this relationship, Skee-Ball, Inc. seeks to stop Full Circle from using the name “Brewskee-Ball” claiming it infringes, dilutes, and tarnishes its famous Skee-Ball mark. There is an obvious connection between the trademark “Skee-Ball” and the service mark “Brewskee-Ball.” Without a doubt, Brewskee-Ball is merely the word “brew” added to Skee-Ball. That being said, it is difficult to imagine that anyone would believe that “Brewskee-Ball” was somehow sponsored by the manufacturers of Skee-Ball machines, rather than the bar where the tournament takes places. Moreover, an increase in popularity of “Brewskee-Ball” would only serve to increase the sales of official Skee-Ball machines. Skee-Ball, Inc. could even come out with a “tournament” line of machines to sell to bars that wanted to host tournaments. Another synergistic opportunity lost to trademark litigation. If Skee-Ball, Inc. is concerned with the tournament name “Brewskee-Ball” is it also concerned about the names of the teams in the Brewskee-Ball league? Does the Skee Amigos, Skee Patrol, or Skee’s Company further infringe the Skee-Ball brand? We will just have to wait and see as this case is just getting started. 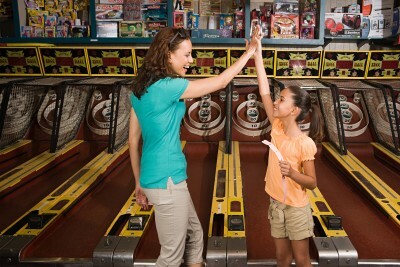 The case was originally filed by Skee-Ball, Inc. in California. Recently the court in California transferred the case to New York after Full Circle filed a motion to dismiss for lack of personal jurisdiction in California. Now the fun moves back east as this case continues.